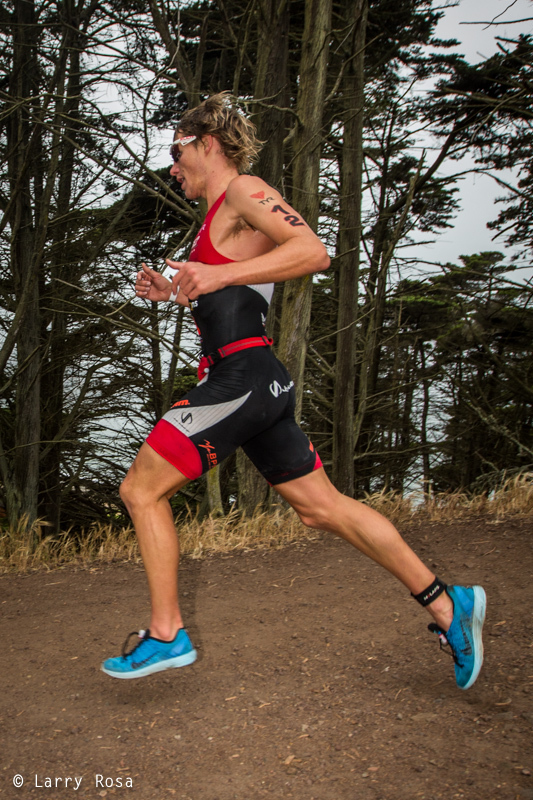 Like many athletes out there, Escape from Alcatraz has been one of those races I've always wanted to do. I've flirted with the chance to race a couple of times before, also not unlike people out there who have to enter a lottery to gain a start for the event. The first chance I had to race was back in 2008 as a 19 year old, but ultimately dates conspired against me, and the ITU Junior World Champs in Vancouver happened to fall on the same weekend. Every year since then, my plans had me on another continent on raceday, so the stars never really aligned. This trend continued last year when I had signed up for the race with flights booked, only to sustain a stress fracture 10 days before race start. Cancel that trip. 2014 rolled around without any major mishaps, and I got to San Francicso fresh off a training block in Tucson AZ, mentally ready for the challenge ahead. The race was going to be challenging for two reasons. Firstly, the field was hot. Andy Potts was starting as a 5 time winner. This race is pretty much his home turf, he's got it nailed. Bevan Docherty was also coming off a win in IMTX two weeks earlier. Little training in between races had him fresh for Alcatraz with surprisingly vicious short course speed. I wanted a win, but these two guys were always going to make it diffucult Among some other strong starters were Graham O'Grady, Matt Reed and Brian Flieschmann, both either with past winners or podiums on this course. The second challenge was the course itself. It's a swim that everyone struggles with, no matter what ability. Currents and brutal chop hold back even the best. Not to mention the bike & run, where you are literally scaling hills the whole time. The morning started with a 5:30am arrival at transition. After a quick set up, I dropped the kids off at the pool and got on the bus to head to the pier for the ferry departure. Once on the boat, it's nothing but waiting around for a 6:30am departure and 7:30am race start. I lay on the ferry floor in a catatonic state thinking about what we were about to do. I've never been so pumped for a race start but sitting so still at the same time. It was a weird experience as there's not much room to move on the boat. Once one pro suited up it was like a row of dominos and soon everyone else was doing the same. At this point we started to jostle towards the side of the ferry near the exit, ready to nab our starting place when the signal came. The carpeted floor was surprisingly wet even though no one was allowed in the water before hand. It doesn't take much imagination to work out what that was about, sorry boat people. So on the command we herded out the opening on the side and hung against the railing looking at the cold bay before us, and trying to make out the landmarks to site in the distance. I really had no idea what I was doing, so my goal in the swim was simply to stay with Andy Potts. The horn blew and we were in the water, but it wasn't as cold as I was expecting. That's a good start. I quickly found Andy and set about dialing myself into the pace on his feet. As we got further into the bay the swell picked up. We were getting tossed around like ragdolls and I was taking in a lot of water when I was breathing. Minute by minute it got harder to stay with Andy. I was totally gassed about 10 minutes in and had to let him go. I'm not sure what was holding me back in the water, I've never been outswum by Andy so it was a hard pill to swallow knowing that was my chance of winning ahead of me, but I knew it was important to just stick to my pace so I held back. It was truly the only challenging swim I have ever done in triathlon, and I was relieved to finally see the shorline. I counted that I was about 30 seconds back to Andy, a gap I thought I could peg back in the ride. From the swim exit everyone faces a 1km stretch of pavement to T1. Some choose to put shoes on, others strip the wetsuit, but pros just gun it. Man that hurt the feet, but who wants to stop, it's a race! I could see Andy ahead of me & I was keen to get on the bike & begin the chase. The first mile is flat, at which point the climbing begins and doesn't really stop until one reaches that same point on the way back. Up we went, through enchanting forest of Australian gum trees and under the Golden Gate bridge. I was climbing well, but Docherty was climbing better. He caught me in no time and we rode in stagger together for another 5 minutes until I had to let him go too. I didn't know what to make of it, because my power was great. I was honestly expecting the others to ride up to me as well but I kept my head strong and kept battling through. There were points where I could get glimpses of Bevan, but at no point did he look like he was coming back to me. My running isn't at the ability yet where I can chase guys like Bevan and Andy down, so at this point I conceded to race for third place. I hit the run with a good stride, kind of anxious at what lay ahead. The run follows the same direction as the bike so I knew the scale of what climbs we had to cross, but I had no way of running the course before the race so I was going blind. Again I caught a fleeting glimpse of Bevan in the first mile and I kicked a little, thinking there was a chance of catching him if he had tired Ironman legs. Eventually I got to the first staircase and I was ascending well, but with wobbly legs like a foal. Do I jump two steps at a time, or two then one, one step a stride? So many questions, but to get up anyway I could suited me. After a fun trail section with intermittent stair cases I hit the downhill with a smile. I cranked that out, but still with caution against the rocks and tight gravel corners that would topple me if I wasn't careful. At the bottom of the downhill one hits the out and back section along the beach, the only spot to get a decent time gap on your competition. It was exciting to see the race unfold between Andy and Bevan, they were tied at about 30 seconds apart. I was further back at about 2 minutes, but with a huge gap to fourth. I could relax a little and focus on the next speed bump, the sand ladder. You run to the sand ladder over a good 30-40 meters of soft sand, so you're literally hitting it with no speed. The first five steps are okay, the next couple hundred or so is just the most heinous, diabolical affliction you could ever feel in your life. Half way up all you are seeing is stars. I felt embarrassed to walk, but looking at my time I was only a few seconds off Bevan and Andy. This makes me feel better about doing it next time as I thought I would have lost minutes ascending that thing. After the sand ladder you continue to climb for another few minutes, but this feels easy compared to the ladder. It's almost too easy you can't believe it. I would hate to of been locked in a battle at this point though as there's still a lot of technical trail, stairs and descents to negotiate on the way back down the headland. I was able to enjoy the last couple of miles though, but it was interesting trying to dodge athletes on the way back. Some were to the left, some to the right of the trail. Either side works when you're in to much pain to care I guess. The last five minutes of the run was lined with crowd which made it very memorable finish. I doubt there would be an athlete finish without a big dirty smile on their face. Me; I was smiling because I secured myself a podium to two great athletes in an iconic race, but also because it was simply the best race experience I've ever had. A thanks goes out to IMG for keeping the race alive each year and for having me along to the iconic event. I will be back! Thanks to Rocky Arroyo, Larry Rosa & Justin Green for the pictures!